GREAT WHITE VIEW-SKI ON SKI OFF from 2 Trails - HOT TUB AND SAUNA INCLUDED!!! Enjoy yourself in a very well appointed luxury condominium right on the mountain! 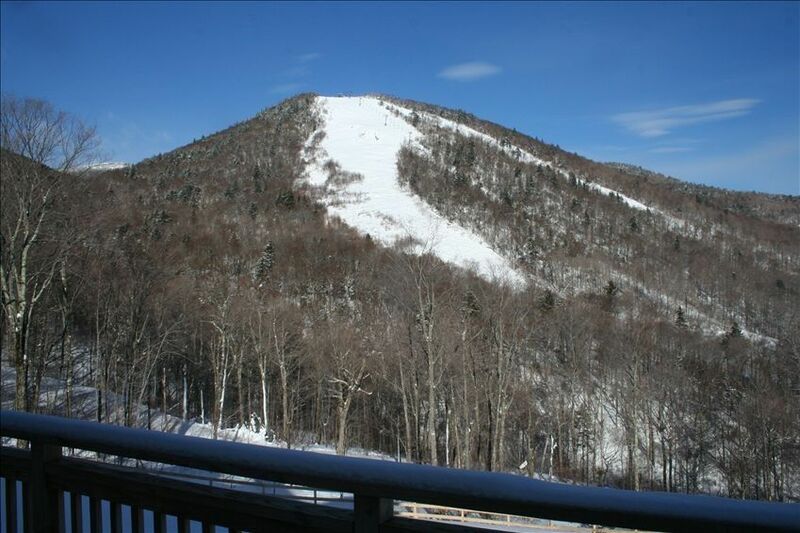 This condominium is part of Topridge Condominiums located on Sunrise Mountain and facing Bear Mountain Peak(which is part of the Killington Mountain Resort).We are the end building closest to the Bear Cub Trail. This home is owned by my husband and myself. WHAT YOU SEE, IS WHAT YOU GET! (unlike other Killington listings that are managed by a rental company-with a phone number to call for rates,reservations and availability)! Ski out your own back door right down to the Bear Peak Lodge and get on the newest high speed Quad or walk across the street and ski down Upper Sun Dog Trail to the Sunrise Mountain Lift. This lift is free of charge, so beginners can try it out for free without having to pay for a lift ticket. Plenty of ski practice with no charge. After a long day of skiing enjoy the 8 person hot tub on the deck with breathtaking views of Bear Peak. Then go into the Sauna to warm up a bit. (THE ONLY CONDO PRIVATE SAUNA IN KILLINGTON). The Living room (with cathedral ceiling)/Dining room combination is great for entertaining or just watching TV or a movie on the High Def. 50' Plasma TV. Our renters have never been disappointed and many return for multiple visits... PLEASE CHECK CALENDAR ON THE WEBSITE FOR AVAILABILITY. We chose this property because of it's unparalled access and views to the mountain! Killington. it accesses 2 trails , a beginners trail ( free of charge) and a an easy trail to Bear Mountain. It is less than 4 hours from our home in Rhode Island and has an execelleny reputation for its snow making. Hot tub on deck and Sauna in condo. All bathrooms have showers. Master bathroom has shower and bathtub. Condominium has a activity center (Sunrise Act. Center). There is a restaurant, pool, sauna, steam room, gym, snowshoeing and cross country trails. Condo accesses 2 trails. Across the street from the front door is Sundog Trail. It is a beginner trail which leads to the Sunrise restaurant, gym, pool, skating pond and cross country skiing trails. Same as ski in trails. Bear cub trail is accessed from the bottom back door. It leads to Bear Mountain where tickets for Killington Mountain are purchased. Free local calls + incoming calls free. Towels and bar soap provided. New refrigerator purchased in 2015 with an Ice Maker. Door side water and ice available. Gas stove top. it can be used if for some reason the electricity goes out. High-definition 50' set in living room, 42' high-definition in rec. room, high definition in master bedroom and 2 regular TV's in other bedrooms. Numerous games and puzzles in bookcase in lower level. Huge oversized 550 sq.ft. deck with Hot Tub and Chairs & small tables. Ski in, ski out to 2 trails 1trail to Sunrise Mountain is free. Approximately 4 miles down the road. Across from the Killington Grand Hotel. In the lower level it can accommodate up to 8 people. Heated Indoor pool and regular outdoor pool. Holds up to 8 people and is located on deck overlooking the mountain. We went up for a quick weekend day trip. We all had an amazing time. Easy access to the trails, close to everywhere you need to be (bars, restaurants, etc.). The house itself was beautiful and more than enough room for 10-12 people. Beautiful view of the mountain. Hot tub overlooking everything. After a long day of being on the mountain, it was great to come back and relax in the sauna/ hot tub, and light a fire and enjoy the company of loved ones. Plenty of room. Great location. We rented this during Feb break with two families - kids ranging in age from 7 to 14. Plenty of room for everyone to find their own space or for all of us to gather together. Great proximity to the slopes. Perfect for stopping for lunch or rest for the young ones while others skied. Fairly well stocked kitchen to make your own meals. The kids loved the pool table, hot tub and sauna. Responsive owner. Great place for big groups. Can’t beat a true ski-in ski-out experience! We have stayed here before and loved it each time. We had a great time again! We had one small issue that I contacted Maureen about and she responded right away and made every effort to solve the problem. That was really appreciated! We love this condo! Great location. True Ski On/ Ski Off Great for 2-3 families. 2nd stay and we will be coming back. Best Ski in/ Ski out at Killington! Place was great and had everything you could ask for and plus some. After two very long and very cold days on the slopes coming back to a nice fire and hot sauna was everything we needed. Rates are subject to change until confirmed. LEASE AGREEEMENT MUST BE SIGNED BY TENANT AND RETURNED TO OWER WITHIN 24HRS OF BOOKING!